Today I obtained the Death Certificate of my 2nd great grandfather Robert John Steven Sellers who died in Sydney on 18 Jan 1908. I believe I have been able to make out all but one word (indicated by ??????). What is the word on the line after Scotland (which I have shown much larger below)? Could it just be "About"? 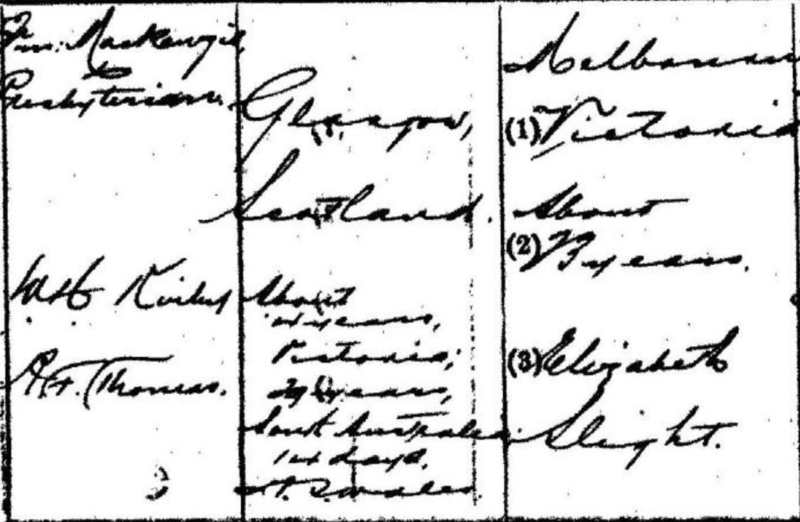 Where born is actually incorrect because he was born 1854 in Albany, New York, USA of parents who were British Subjects (they married 1850 in Glasgow). He did live in Victoria for 4 years (1874-1878), and South Australia for 29 years (1878-1907) plus a few days before the 14 days he spent on leave in NSW. I agree that it is About. However, if I am correct the age given next to (2) appears to read 23 years not 29 years. Not the answer you're looking for? Browse other questions tagged palaeography death-records 1900s-decade new-south-wales or ask your own question. Transfering money between England and New South Wales (Australia) in 1850s?